Groups are a great way to handle parts of a mix before they go to the record pressing plant via the Master Out. As you may have noted yourself the Master is where it all comes together so if you whack a 32nd-note BPM-synced Phaser on the Master in a fit of LSD induced midnight “creativity” and then in the morning think oh geez, maybe if the vocal wasn’t in there you are a bit stuck. However before you have to provide LSD with every copy of your record you can use Groups. In this instance you would want two Groups, 1) most of the mix; 2) vocals. Each of these can be processed as you see fit before being fed to the Master Outs (two because we are all in-stereo these days). I will assume you are using Reason for this part of the Tutorial but the theory is the same (just some DAWs make you lazy by having Group buttons – kids these days pfft). On the back of each Mix Channel there is a Direct Out. This takes the sound you have made, complete with any Insert effects and and lets you wire it off to some other place in the (Reason) universe. 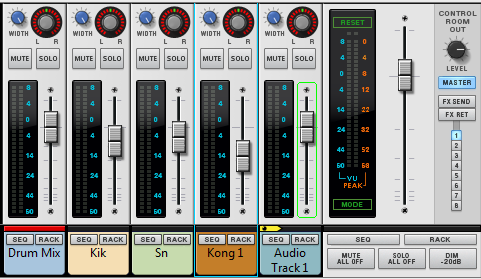 Create another Mix Channel, call it something like Main Mix or Vocal Mix, pop it before all the related tracks. Right now you have a Channel with no audio; wire in a Mixer – 6 Input Line Mixer or the 14 Input jobby depending on how many tracks you have flying over. Now simply use the Direct Out from each of the Mix Channels in the Group you are creating and wire each to an input in your mixer. Once done you can create your section mix and then control the whole mix with the Group channel Fader, Pan, Insert and Send Fx. To keep our (rather silly) example we would pop that wacky Phaser onto the Main Mix Group and leave the Vocal Group alone. The two signals would go off to the Masters and the record pressing plant with no need to work out how many jars of mayo to tape to the front of each copy. 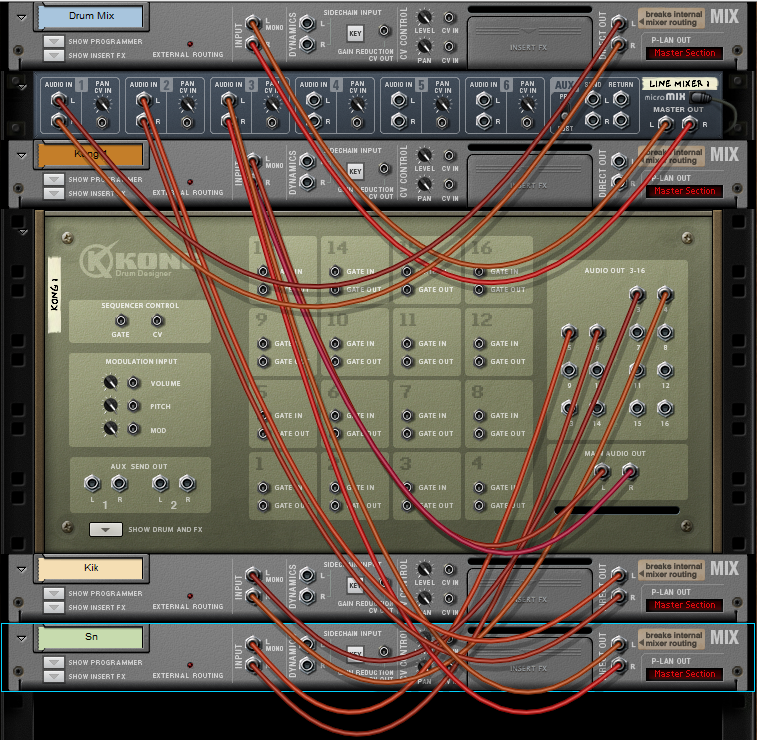 Now in a more normal session you may create Groups of Drums, Vocals, Brass, Strings and anything else that amuses you. 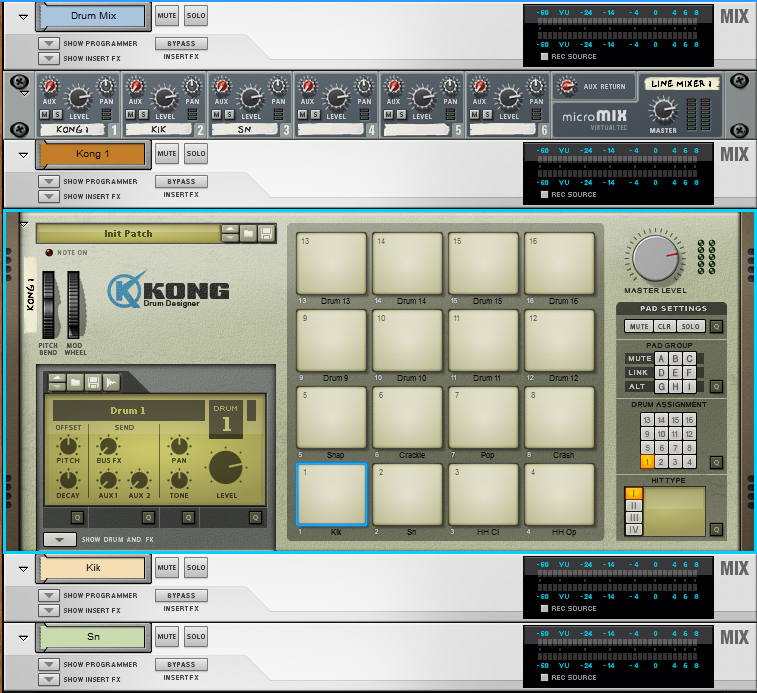 The screenshots here are of a pretty simple drum group.